﻿ Nothart Industry Sectors | Commercial| Nothart Engineered Sales Ltd.
People need to live, work, shop, exercise, and sleep in relative comfort. Some of those comforts and safeties are provided by good water systems, and fire pumps. 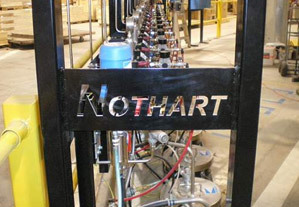 If you own a commercial strip mall or free standing building, the Nothart team can help size and select boilers, and pumps of all kinds to provide years of trouble free operation. If your original pump isn’t giving you enough pressure, let us suggest an upgrade. For you folks in the Resort or Hospitality Industry, we are the Distributor for Canada’s premier Copper/Silver Ionisation system to control Legionella in your Domestic Hot Water systems. We look forward to your calls as you require further information.